Manchester City will not face any Uefa sanctions after their fans booed the Champions League anthem. Uefa's disciplinary body reviewed the case after fans booed before the 2-1 home win over Sevilla on 21 October. The case was considered after a report by the European governing body's delegate at the match. 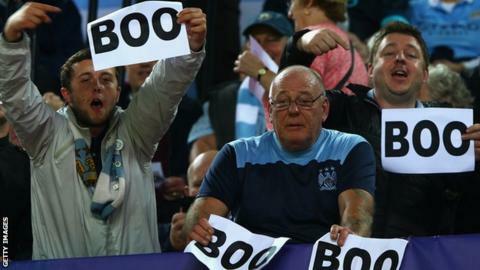 City's fans are understood to have booed the anthem repeatedly over the past year to express anger at Uefa over a number of issues. The club were fined £16.3m in May 2014 after breaching Financial Fair Play restrictions. A City fan group also led a protest against Uefa after 650 CSKA Moscow supporters gained access to the Arena Khimki for their Champions League game in October 2014, despite the Russian club being ordered to play it behind closed doors. CSKA were handed the sanction as punishment for a series of offences including racist chanting. The report of the booing had been made by match delegate Geir Thorsteinsson, the chairman of the Iceland Football Association, which led to disciplinary proceedings being opened. Meanwhile, City manager Manuel Pellegrini has declared striker Sergio Aguero fit for Saturday's Premier League home match against Liverpool. The Argentina international has been absent for seven matches with a hamstring injury sustained while playing for his country in a World Cup qualifier against Ecuador in October. "Sergio is fit, he's ready to come back," said Pellegrini, who added that City will be without playmaker David Silva (ankle), striker Wilfried Bony (hamstring) and captain Vincent Kompany (calf). Winger Raheem Sterling is set to face his former club for the first time since a £49m move from Liverpool in July. Pellegrini said: "I always think it is special for the player to play against his former side. Not only for Raheem, but for any player to face a team for whom they played for many years. "I always say that Raheem is a very young player. He must improve a lot, but I am very happy with the way he is playing so far."